The bat has probably the worst reputation of all animals in art and literature. But why is that so? What image comes to your mind if you think of a bat? A disgusting and ugly animal with sharp teeth - the creature that forms the legend of Dracula? Or of fluffiness and cute little noses? 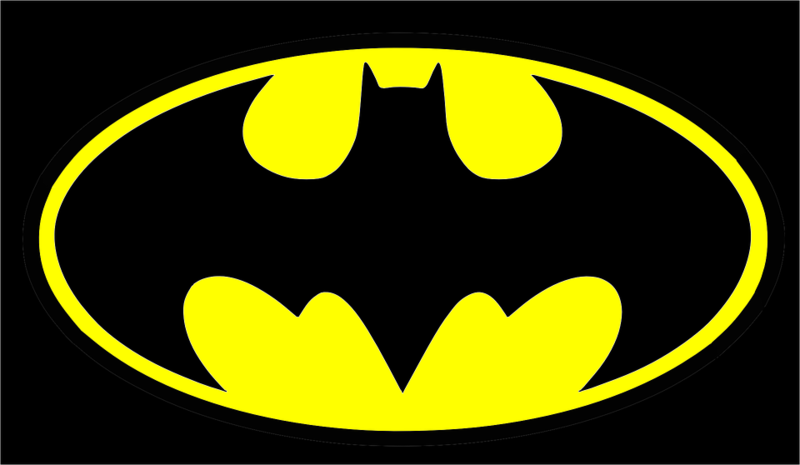 The trademark of the hunter of the night in Gotham City and most awesome nightmare of criminals: Batman. He features a split character - in the night he is the Hero of the City in his bat-costume and during the day his identity changes to the billionaire Bruce Wayne. When he was thinking about a suitable occurrence to hunt the criminals, a bat flapped into his villa. It seemed for him the perfect symbol to frighten the gang of crooks, because Batman remembered that they are superstitious and all in all a sneaky vermin. And bats eat vermin. So Batman took over the appearance of the bat – and also its myth, to hunt criminals. First, a few biological facts about bats. The name of the biological order to which the bat belongs, Chiroptera, derives from their activity: they actually fly with their hands. Chiroptera constitute one of the most diverse order of mammals after the rodents: In total there are 4.250 species of mammals – and around 925 species are Chiroptera! Bats are usually classified according to the shape of their noses or ears. However, sometimes it´s not easy to choose the one or the other…. Bats are divided in 2 suborders: Megabats and Microbats. The largest bats, the Megachiroptera, contain 166 species. 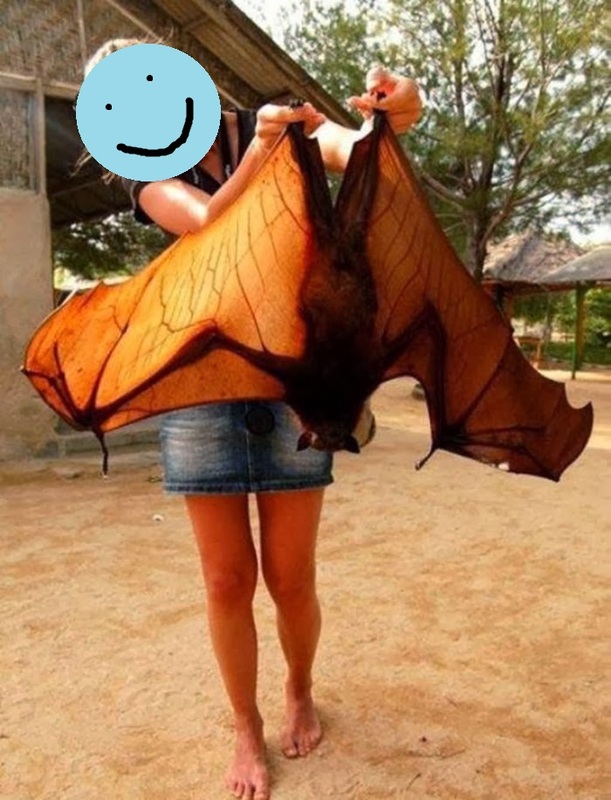 They are also called Fruit bats or Flying foxes and live near the equator. Their diet consists of fruits and vegetables track down through their excellent sense of smell, contrasting with the Microchiroptera, who use echolocation to hunt insects. Microbats are the most diverse of all the Chiroptera: they contain 759 species (around 40 in Europe) which can be found almost all over the world except for in very cold regions. Most of them hibernate and form giant groups, living in caves or hang around somewhere during the day, maybe in the attic right above your bedroom. 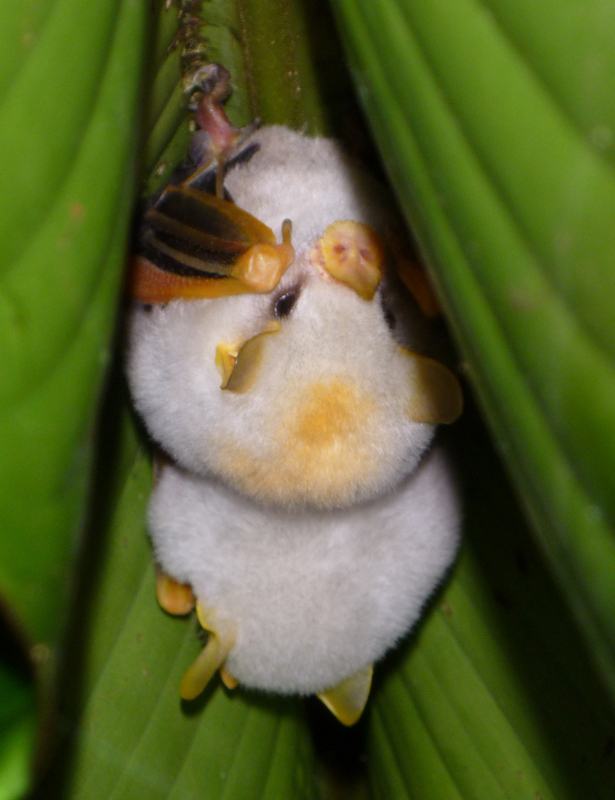 Since Aristotle, one subgroup of Microbats is called Vespertilio (latin: vesper = evening)– a name that directly refers to their nocturnal activity. Until the end of the 17th century the bat did not have a niche of its own in the classification system of animals because it combines two characteristics that do not occur together in any other animal: bats fly and give birth to living offspring. So what to do with an animal that looks like a mouse and has wings like a bird? Aristotle (384-322 v.Chr.) first put the bat in the category of birds. Later on, in his "De Partibus Animalium", he changed his opinion and put it in a grey area; more specifically, in a class of animals that belong either to two classes at the same time, or to none at all. Since the 16th century, however, more differentiated observations supplemented the ideas of the ancients on categorization. In the third volume of "Historia Animalium" (1551-1558), Conrad Gesner (1516-1565) placed the bat into the book of birds "Avium Natura" (1555). Gesner called it an animal between a bird and a mouse but nevertheless gave it the name "bird" in his text. It was not until the end of the 17th century that the bat was clearly separated from the bird and classified as a mammal: John Ray made this step in "Synopsis methodica Animalium Quadrupedum […]", London (1693). 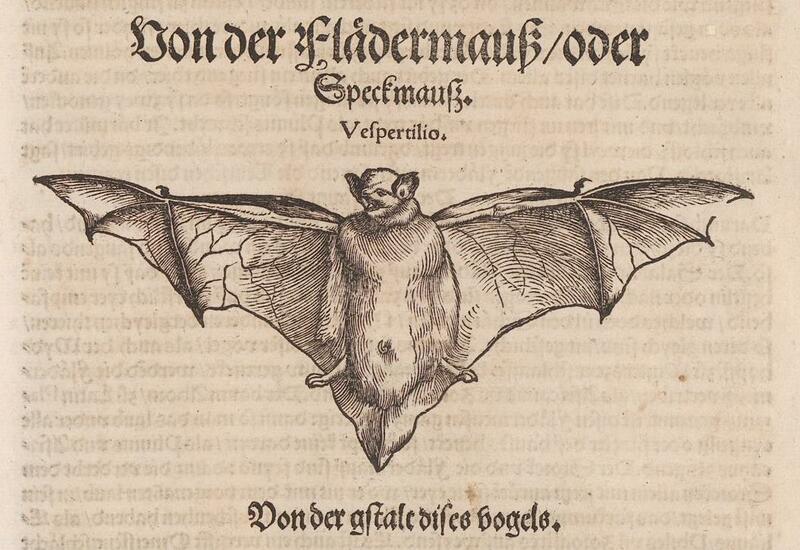 Since Johann Friedrich Blumenbachs "Handbuch der Naturgeschichte" (Göttingen 1779), the Chiroptera formed its own order within the order of mammals. 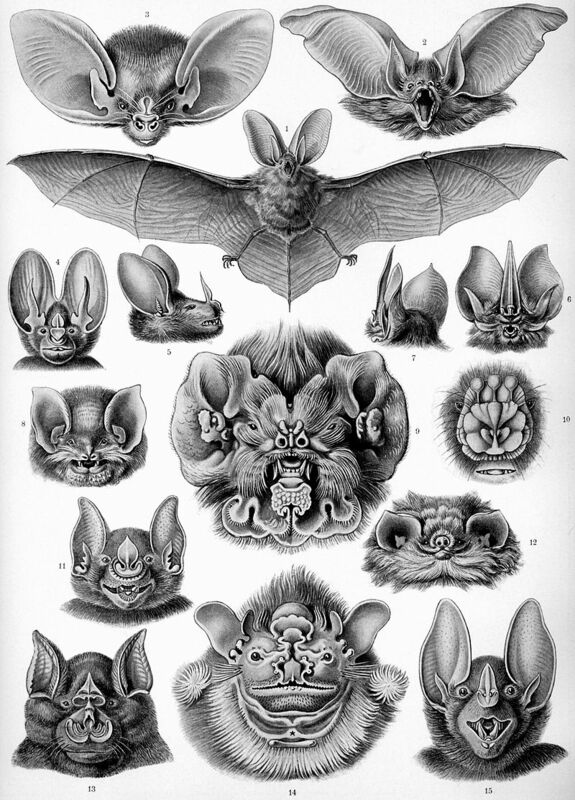 The natural history of the bat can be seen as a long controversy about the bat’s unique features. For me here it is going to be very interesting, because these features came back and form a story of their own in a more moral and fictional kind of literature: fables. 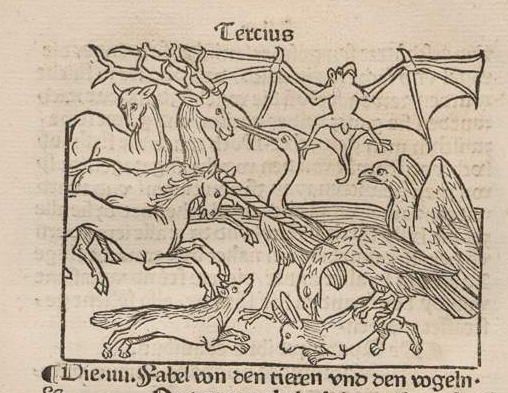 One fable describes a bat as an ambiguous creature, ever since the ancient Aesopian editions. 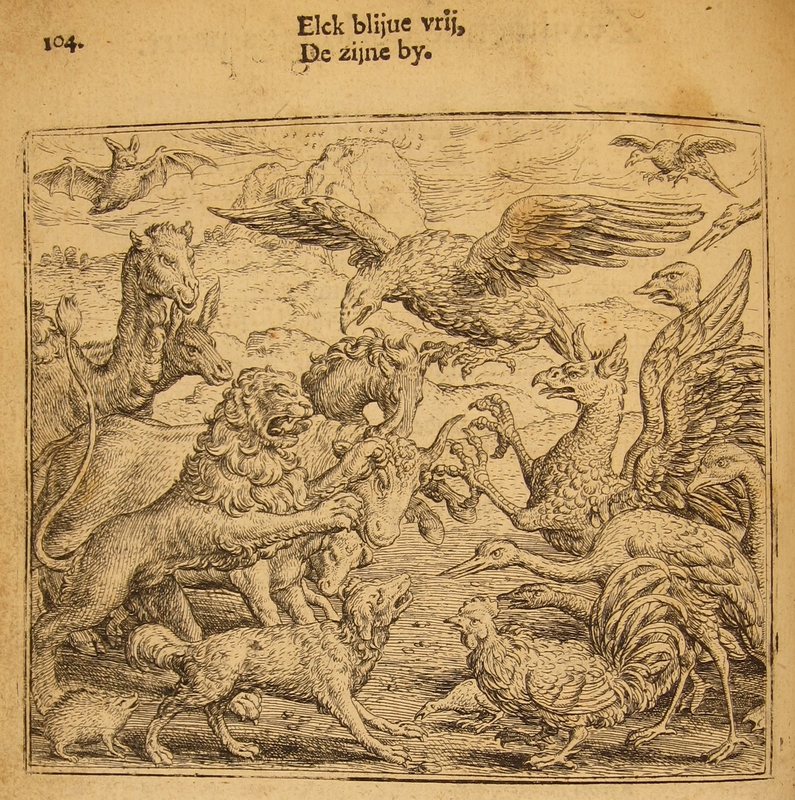 As an example, I want to introduce a famous illustrated fable book of Eduard de Dene: “De Warachtighe Fabulen der Dieren” (1567). It is illustrated with a new technique: etchings, made by Marcus Gheeraerts (ca. 1520-1590 and because of these etchings it kept its popularity until the 18th century. In contrast to the plainer designed woodcuts in older fablebooks, etchings could be worked out in much more detail and thus became attractive for the reader. 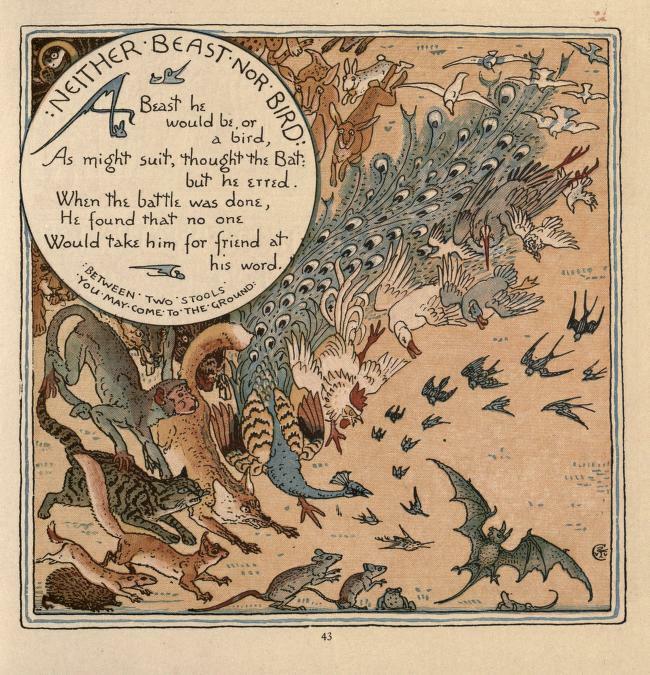 In the Fable “The Birds and the Beasts” a great conflict was about to come off between the birds and the Beasts. When the two armies were formed the bat hesitated about which group to join. The bat assumed that the birds were too weak and hence became scared and changed the camp to the beasts. In the end, the beasts lost the war and they arranged a truce. But the birds noticed the unsportsmanlike behavior of the bat and punished it: because it betrayed its comrades, it henceforth had to fly alone in the night and could not participate any longer in the community of birds. The moral of the story is that if you benefit from the wealth and luck of others, you have the duty to help them out in times of fear and sorrow. Over centuries the fable, one of the most popular and maybe most influential kind of cultural products, defined alongside natural history the bat as an outsider. And the potential of the bat to serve as a mostly negative symbol could be proven furthermore with some emblematic pictures. Depictions of the bat as an attribute or symbol were also common: it could be a symbol for the night or the evening or a personification of age. Here it works as a comparison between the ages of men and the times of the day. Another reference is to death and vanity. Another important iconographical function for the bat is as a companion of the personification of inconstancy. Cesare Ripa (ca. 1560-1622) described this function in one of the most important books for artists and art historians, the “Iconologia” (1593). 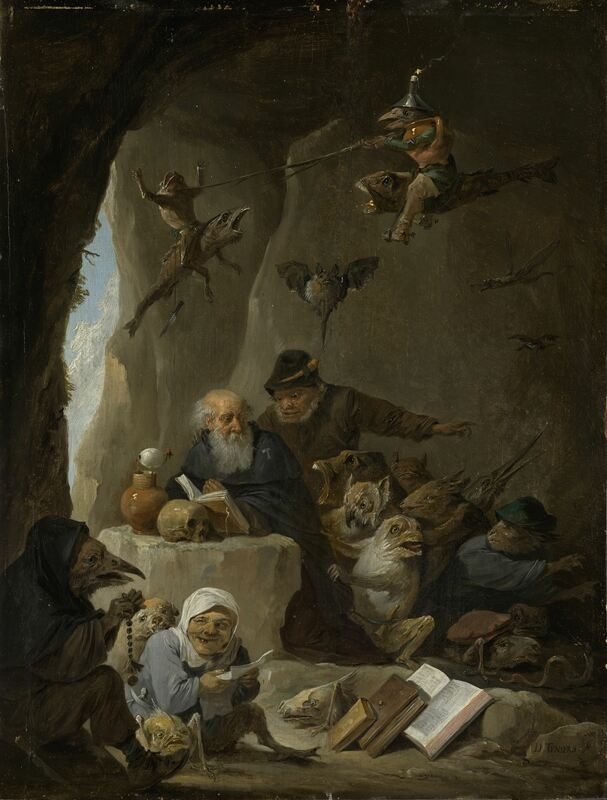 “The Temptation of St. Anthony” was also a very favored subject, in which the bat appears as a symbol of badness and evil. There hangs a fat and ugly bat in many paintings for example those by David Teniers II. 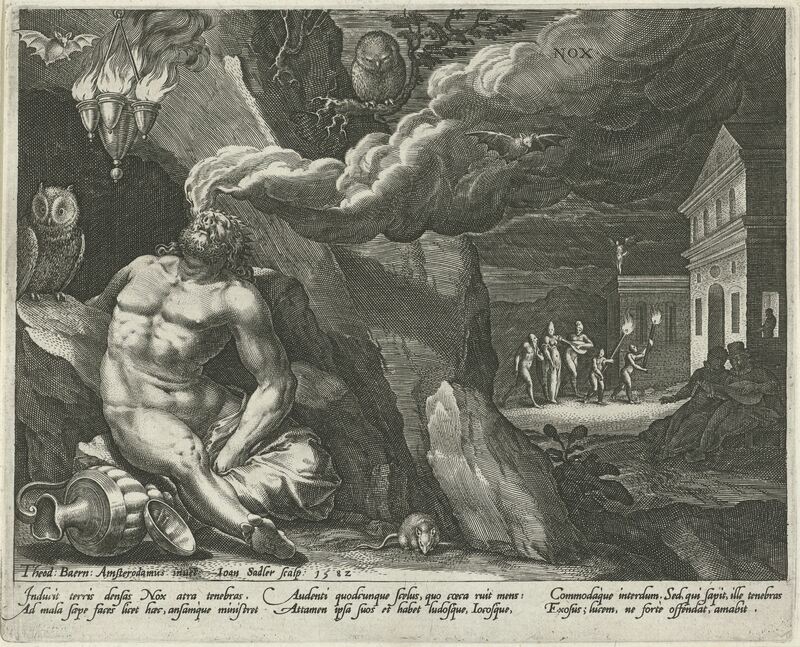 (1610-1690), supporting the hellish going. And it is only a little step from the bad animal as a symbol for evil to use its most characteristic body part to form a bad message: the wings. Since the Middle Ages demons from hell wear bat wings. With their skin and dark surface they form the very opposite of angel wings which consist of white and sometimes very colorful feathers. - Having a look at China and taking this as a role model: Here the bat serves as a symbol of luck and is used to decorate houses and wedding blankets. The reason is that the Chinese sign for the bat, 蝙蝠 (biān fú), already includes “luck” in its meaning. Therefore, let´s change the perception from bad bat to bat luck! © Lisanne Wepler and Leiden Arts in Society Blog, 2016. Unauthorised use and/or duplication of this material without express and written permission from this site’s author and/or owner is strictly prohibited. Excerpts and links may be used, provided that full and clear credit is given to Lisanne Wepler and Leiden Arts in Society Blog with appropriate and specific direction to the original content. Bats are incredibly important to our surrounding eco-system. Do you like mosquitos? Bats do! And they eat all of them so that mosquitos aren’t eating you at your backyard cookout party. 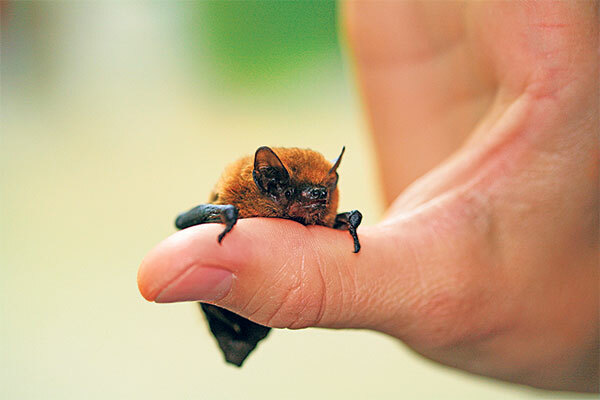 Aside from insect control, bats play a major role in our environment. It is important to always respect bats, and understand that they are innocent mammals that only want to survive.